Thursday: Periodic downpours and thunder break into scattered PM showers, humid. Highs in the 70s. Overnight Thursday: Areas of fog. Lows in the 60s. Friday: Summer sun, humid start. Highs near 90. A well organized low-pressure system is pushing a swath of rain across New England Thursday morning. 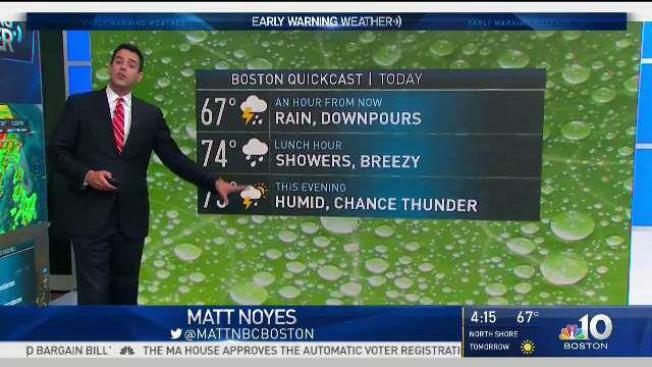 It is a wet Thursday with occasional rain heavy at times, a few thunderstorms possible, high temperature in the 70s, with the dewpoint also near 70 it is a very sticky day. Rainfall amounts could locally exceed two inches, especially in Vermont, New Hampshire, and Maine. Most of us should get a quarter to a half inch, if not more. The National Weather Service issued a flash flood watch for parts of central Massachusetts, New Hampshire and Maine. Several thousand Connecticut customers lost power on Thursday morning after storms rolled through the state. Pooling water on roadways in Vermont caused numerous incidents and crashes. The weather system moves out of Maine on Friday, and with increasing sunshine for New England, it will still be humid, with temperatures in the 80s. The heat really starts coming in on Saturday, with plenty of sunshine and a high temperature passing 90 degrees for most. The exception is at the beach with locally onshore winds keeping us around 80 degrees. Humidity drops a bit Saturday, then sticky air returns later Sunday and early next week. With sunshine Sunday, the temperature may go to 95 to 100 degrees, with record-challenging heat possible. The heat backs off a little bit Monday, and there's a chance that some of the coastal areas may cool significantly, with patchy, dense fog developing. Humidity builds back up, and with that, we have a threat for thunderstorms Monday. Better chances for thunder are on Tuesday, July 3 and Wednesday, July 4 each afternoon and evening.